brokenclay.org/journal > Life with a Disability > Exercise/Sports > Reality Check, Anyone? In the absence of a dramatic relapse, it seems to take me weeks to recognize a downturn. And the thing that should really tip me off is my sudden inability to exercise. But no. I spend weeks berating myself for not being able to do four or five workouts a week “like everyone else”. There doesn’t seem to be any middle ground between going full bore and feeling like it’s a major effort to drag myself out of bed to go to work three days a week. 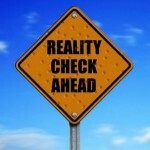 Where’s the Reality Check fairy when you need her? I’m also a self-berator–when I start to slow down with a major flare, I’m really annoyed and trying to do more but can’t. Then when it really kicks in (like the past few days), I have no choice and ‘understand’ my inability better. Hope this relapse is as short as possible for you. Reality Check Fairy. That’s a job I’d LOVE to apply for ;) Could I just go around randomly giving people unsolicited reality checks? It sounds too good to be true. I hope you start to get better soon. I’m PPMS, so I’m supposed to feel the same every day (except ever so slightly worse), but my ability to exercise is just all over the place. I ride a hand peddle bicycle (really tricycle) and some days I can do 5 miles and other days 2 miles, and I never know what kind of day it is going to be until about 1 mile. It is disappointing on those short ride days, but I’m getting better at not blaming myself for them.